Apple's goal has always been to make powerful technology more accessible. More relevant. And ultimately more personal. Apple Watch represents a new chapter in the relationship people have with technology. It’s the most personal product Apple ever made, because it’s the first one designed to be worn. 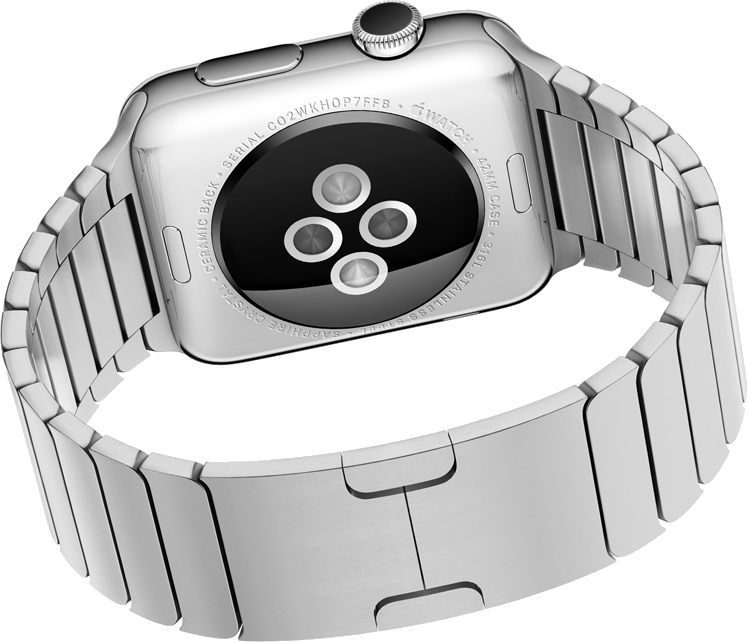 Every aspect of  Watch is designed for precisely when you use it and where you wear it — on your wrist. Each interaction is quick and light. 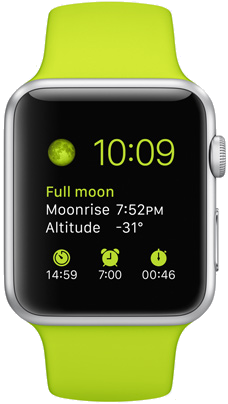 Right from the watch face, the Glances feature gives you real-time views of the information you check most often, like the weather, stock quotes, upcoming calendar events, and more. Apple Watch notifications take on a whole new feel because they discreetly come right to your wrist. And they’re designed to let you address or dismiss them just as subtly. High-quality watches have long been defined by their ability to keep unfailingly accurate time, and  Watch is no exception. It uses multiple technologies in conjunction with your iPhone to keep time within 50 milliseconds of the definitive global time standard. And it can automatically adjust to the local time when you travel. Apple Watch also presents time in a more meaningful, personal context by sending you notifications and alerts relevant to your life and schedule. 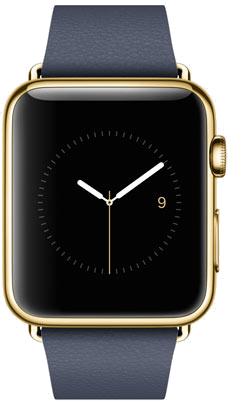  Watch is right there on your wrist, so it makes all the ways you’re used to communicating more convenient. And because it touches your skin, Apple were able to add a physical dimension to alerts and notifications — you’ll feel a gentle tap when you receive an incoming message.  Watch also allows you to connect with your favorite people in some new, spontaneous ways not possible with any other device.  Watch gives you a more complete picture of your all-day physical activity because it measures more than just the quantity of your movement, such as the number of steps you take. It measures the quality and frequency as well. The three rings of the Activity app show your progress at a glance and provide the motivation you need to sit less, move more, and get some exercise. There’s also a separate Workout app for dedicated cardio sessions. Over time,  Watch can use what it learns about the way you move to suggest personalized daily fitness goals and encourage you to achieve them. So you can live a better day and a healthier life. 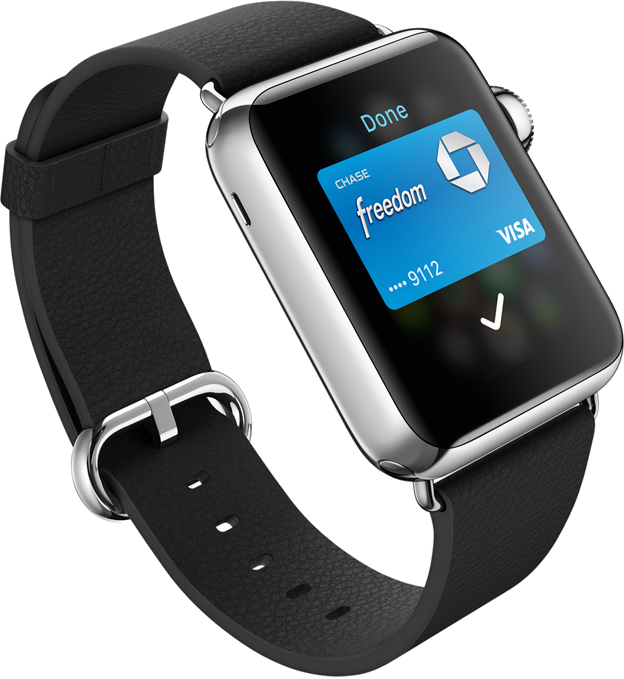  Pay is an easy and secure way to pay using your  Watch. Now you can buy coffee, groceries, and more right from your wrist. With a simple setup, you can use  Pay at hundreds of thousands of U.S. locations, with more to come. Incorporating powerful technologies into something small enough to wear on the wrist presented some very big design challenges. Which led to even bigger creative solutions.  Watch combines a series of remarkable feats of engineering into a singular, entirely new experience. One that blurs the boundaries between the physical object and the software that powers it.  Watch isn’t just a different location for your favorite apps. It’s an entirely different way to experience them. A time-saving feature called Glances condenses the most relevant information from each app into a form you can easily scan on the fly. And because  Watch can tap you on the wrist, you’ll be aware of notifications instantly. Calendar. See what’s next in your day or month. 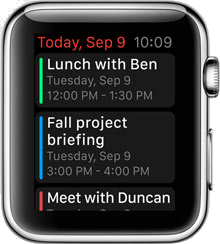  Watch sends you meeting reminders, as well as calendar invitations you can accept or decline directly from your wrist. Remote Camera.  Watch doubles as a remote viewfinder for the iSight camera on your iPhone. 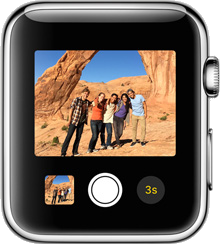 Use  Watch to display a live preview of what your iPhone sees, snap the photo, or set the timer on the camera. Stopwatch. 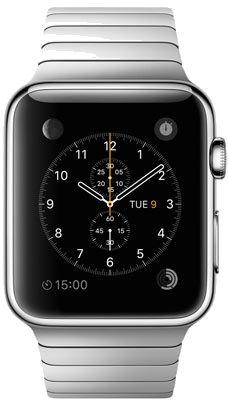  Watch presents this popular watch function in digital, analog, or hybrid view. 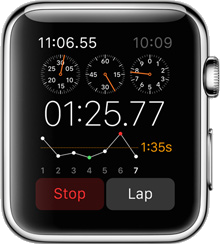 It can even show you a real-time average of your lap times on a graph — something you won’t find on other watches. Anodised aluminum cases in silver or space gray. Strengthened Ion-X glass. Colorful, durable bands. Stainless steel or space black stainless steel cases. Sapphire crystal. A range of stylish bands.